Sea turtles lived through the age of the dinosaurs—some as long as 250 million years ago. They have a deep connection within the stories of many different cultures; symbolizing knowledge, wisdom, and immortality. The range of the green sea turtle extends throughout tropical and subtropical oceans worldwide with two genetically distinct subpopulation — one in the Atlantic and the other in the Eastern Pacific. Most sea turtles migrate between foraging and nesting grounds. In Hawaii, the green sea turtle (Chelonia mydas) or “Honu” symbolizes a navigator that can always find its way home. This represents the real life of the green Hawaiian turtle, which often swims hundreds of miles from its feeding grounds to lay its eggs at the very place where it was born. Over 90 percent of the Hawaiian green sea turtle’s nesting activity occurs at French Frigate Shoals in the Papahānaumokuākea Marine National Monument (Northwest Hawaiian Islands). Green sea turtle – Icon of the sea. Mating usually takes place every 2 to 4 years in shallow waters close to sandy beaches. Females will then dig holes above the high tide mark with their flippers and lay up to 200 eggs in the sand. The young incubate up to 70 days in the covered nest. Once they have hatched, they experience the most dangerous time of their life as they make the journey from their nest to the ocean. Multiple predators, including crabs and flocks of gulls, voraciously prey on hatchlings during this short, frantic scamper towards the relative safety of the sea. Baby turtles grow up in the open ocean. I‘ve never seen a baby green turtle, but I have come across a baby loggerhead. This little guy was hanging out next to a piece of sargassum weed floating in the Gulf Stream off the Florida Coast…. Sea turtles may appear clumsy and slow, but they are actually strong swimmers. Using their sweeping, paddle-like flippers and streamlined carapace they can reach speeds of 6 mph. Their neck and limbs do not retract like land turtles, which makes them faster so they can escape predators — such as tiger sharks here in Hawaii. Green sea turtles can live for 80 years or more and take between 25–40 years to reach sexual maturity. Sea turtles are surprisingly agile. The common name comes from the green color of their fat. Adult green sea turtles usually inhabit shallow lagoons, feeding mostly on various species of seaweeds. The turtles bite off the tips of the blades of seagrass, which keeps the seaweed healthy. The beak-like mouth is adapted to scrape and bite. When young, green sea turtles also eat jellyfish, sponges, and crabs. A green turtle (Chelonia mydas) feeding on a sea grass. Sea turtles spend almost all their lives submerged and can stay underwater for up to five hours! Their heart rate slows to conserve oxygen—as much as nine minutes may elapse between heartbeats. The lungs and blood are adapted to permit a rapid exchange of oxygen, even during deep dives. Green sea turtles can hold their breath for hours. Along the coasts around the Hawaiian Islands green turtles gather at cleaning stations. Over time, turtles accumulate algae, parasites, and small invertebrates on their bodies. Tangs and other fishes see those hitchhikers as a tasty meal. This relationship is just one example of a type of symbiosis in the ocean, called mutualism, in which animals of different species form relationships that benefit them both. Tangs and a parrotfish remove algae growing on a green sea turtle (Chelonia mydas). Six of the seven sea turtle species are classified as threatened or endangered. Green sea turtles face a high risk of extinction in the near future because they are killed for their meat and harvested for their eggs. Their numbers are also reduced by boat propeller accidents, drowning in fishing nets, and the destruction of their nesting grounds. The predictability of their nesting habits has made them easy victims. Populations have been completely eliminated in some areas, although they are still reasonably abundant in other areas—such as here in Hawaii where they are protected. Fibropapillomatosis (FP) is a disease specific to sea turtles. FP is caused by a herpes virus and starts out as a cluster of small white lesions around the neck. Gradually those spots grow into large tumors protruding from the eyes, mouth, and neck, and at times also affecting the internal organs. Turtles slowly become debilitated and eventually die from the disease. Eighty percent infection rates of turtle populations in some areas of Hawaii have been reported. 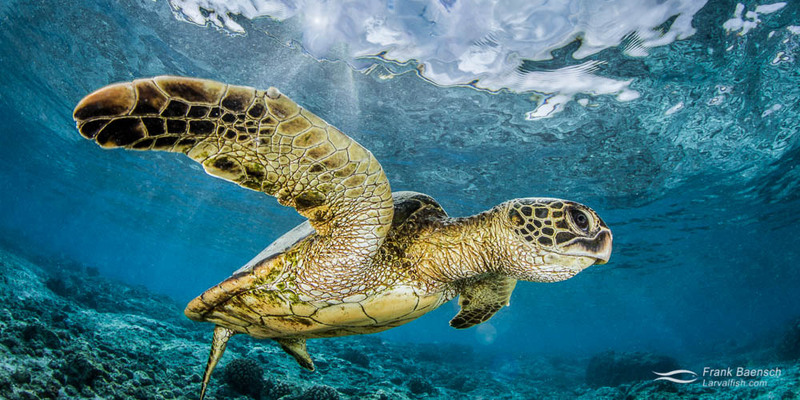 Scientists believe that pollutants may play a role, as the viral incidence is highest among immature green turtles that graze on invasive seaweeds in nutrient-rich coastal waters. They ingest environmental nitrogen in the form of arginine, which has been shown to suppress immunity and promote the growth of the tumors. Most of the turtles I see with tumors live near river outflows on Oahu. Reducing nutrient influx in developed areas is unlikely to happen, but promoting native algae growth through invasive algae cleanups could help reduce tumor incidence. Green sea turtle with fibropapillomatosis. The tumors block the eyes and everntually kill the turtle. Turtles with fibropapilloma often become a target of cleaner fish, such as this milletseed butterflyfish (Chaetodon miliaris) and Hawaiian swimming crab (Charybdis hawaiensis), which apparently feed on parasites that infest the tumors. Green sea turtle with fibropapillomatosis. I sometimes find turtles embedded with hooks near coastal fishing areas— often suffering considerable trauma as a result. Fishing with barbless hooks or hooks that rust out quickly (non-stainless/non-plated) would help dislodge them sooner. Green sea turtle with hooks in various parts of its body.